The real-time agents report is a dashboard that displays live agent status and important call statistics. It includes indicators for call center information (like number of live calls, available agents, missed calls, and queued callers) as well as a chart of recent inbound and outbound call activity. Below that, there will be a timeline of status and user activity for each agent in your account. The real-time agents report can be found under Reporting > Real-time Agents. The Live Activity drop-down can be used to change the day you’re viewing data for. By default, this will use today’s data, but days for the past full week will be available here. The Filters + button allows you to filter the report for a particular queue or agent. The Compact View button will hide the timeline graph for each agent to show only their statistics instead. The full screen button will set the report to full screen mode (perfect for displaying this dashboard on a monitor in your call center). The time range selectors will let you view the last hour of activity, last three hours, last eight hours, or the full day. Custom Statuses: if you have created any statuses for your agents to use, statistics for those statuses will be reflected here in the dashboard. 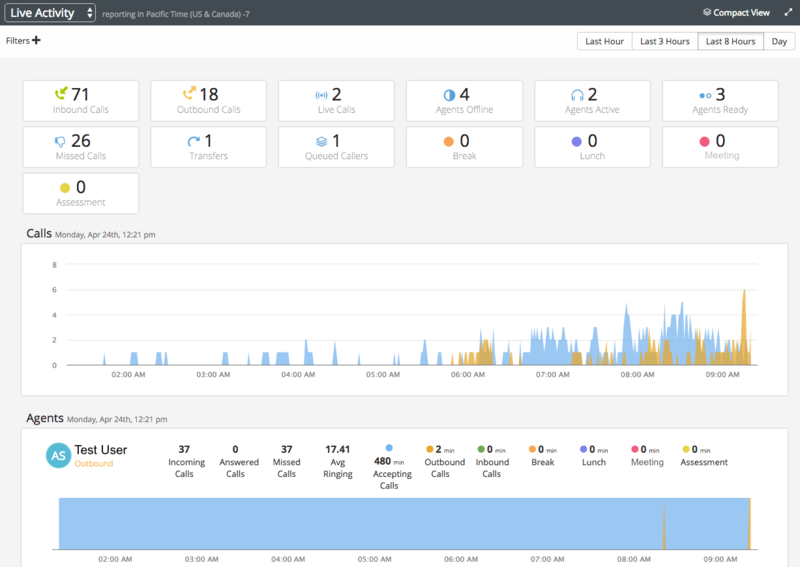 A graph displaying inbound and outbound calls for the time you’re viewing (last hour, three hours, eight hours, or full day) will be shown below the call stats. Inbound calls are displayed in blue, and outbound calls are displayed in orange. Each agent’s activity is displayed on a separate row below the call activity graph. This will include the agent’s call statistics and status as well as a timeline to visually display their status throughout the day. Custom Statuses: if you have created any statuses for your agents to use, statistics for those statuses will be reflected here in the dashboard (such as Break, Lunch, Meeting, and Assessment in the example below).